Cheap tickets: every friday at 1pm 40 tickets will go on sale on line at www.harrypottertheplay.com for each of the following week’s performances for £20 per part - £40 for both parts. Last minute tickets: the capacity of the theatre is 1400 so it’s likely there are often returns available. Check the website for short notice returns. My friend Ash managed to get excellent tickets on the day of the performance by visiting the box office. £40 per part. They were returns. He who dares defeats the Basilisk. There is little legroom, unless you’re short like me you’ll really regret a larger bag, or any bag at all. Unless you've borrowed Hermoine's handbag, then go ahead, put your feet in it and stretch your legs out to infinity - bliss. Newt's case won't fit though. The top is called the balcony, and if you think it’s high, you can’t see the steep rake the seats are at, it gets ever higher. It’s a show that most benefits from stall tickets or something low down. But we weren’t forgotten up the top, creepy creatures flew up to eyeball us and there was a secret revealed more or less just for us. If you are arrive an hour early like they want, to go through security, they will have you sitting in your seats for ½ an hour, after standing in the stairwell. However if you are determined to be a Molly-mort, the queue is a snaking blockbuster, the quickest way to join it is to seek it’s end to the South of the theatre on main road Shaftesbury Avenue. My solitary neighbour arrived 10 minutes before the performance, and she endured less waiting. 20 minutes before is ample. The queue moves fast and your seats are assigned. Actually in the Palace Theatre books might be quite good. They don’t want you bringing snacks or drinks into the theatre because they want to sell you them. They will scan you for metal and search your bag for bombs and ask you to toss food out. The only safe place for snacks is hidden in pockets. They will however allow you to bring water bottles in. They have free self-serve water available in the bars, and this may actually be a good walk about in the interval. 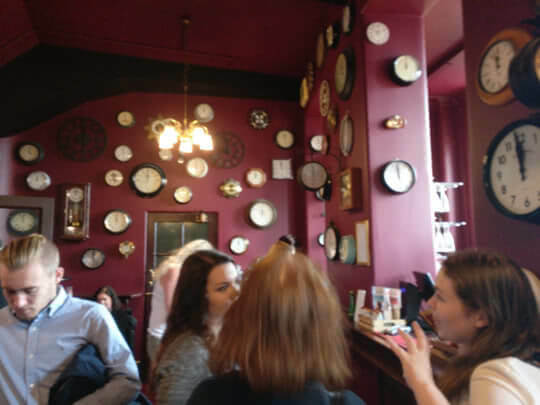 The walls of the bar in the Palace theatre are decorated with clocks. Each part of the play has a 20 minute interval. The theatre seats 1400 people so if you want a drink from the bar that isn’t water get on your broomstick. The dinky pots of ice cream were £3.50, I’m sure Hagan Daz would say they’re the Knight Bus of gellatai, they’ll transport you to another world, I said ‘Get tae Azkaban’. There’s a new boxier graphic design for the play to keep it fresh and you can buy T-shirt and canvas bags with this on. The £5 programme has a couple of good essays in, I wish I could charge five pounds for my essays! For HP fans that’s about it. The picture souvenir guide is sold during the first interval and onward, it cost £10. I think it has pictures in. If you’re visiting with someone who’s never read the books - i.e. a hopeless Muggle - and you don’t have good chat with them the £5 programme will fill them in on what has happened in each of the 7 books. 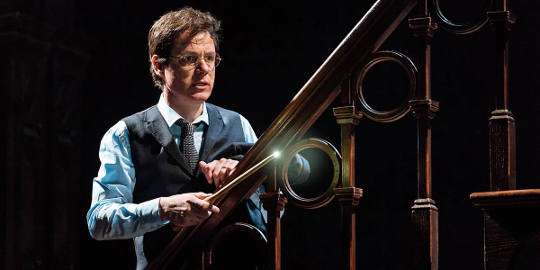 Ideally they’d read them before they go, the play’s plot comes from a couple of Harry Potter fans and is designed to delight readers. London was 21 degrees, hotter than Edinburgh by 10 degrees during my visit in September. It actually has less rain annually than Rome: Repellere tempestatibus! Check the weather before you travel, you may as well pack for life under the Ministry of Magic’s bizzare climate dome. If you have tickets to the stalls, take a walk up the stairs - and down the crowd free fire escape; drink in the opulence. Completed in 1891, the year before Dumbledore is sorted into Gryffindor, the Palace is bedecked with turrets and towers housing splendid Italian marble staircases (lovingly restored by Andrew Lloyd Webber) leading people into the vertiginous auditorium. It seats 1400 but is kept intimate by packing in many narrow floors, rather than breadth. The rear of the lower tiers enjoy unobstructed views, an improvement on earlier theatres, thanks to the innovative use of heavy steel cantilevers anchored in the back wall, rather than pillars to support the higher floors. Sir John Betjeman, our most famous poet Laureate, said the building is ‘the only theatre architecture in London which climbs into the regions of a a work of art’. In 2012 Andrew Lloyd Webber sold the building to Nica Burns - of the Edinburgh fringe comedy award - and Max Weitzenhoffer. It's such a capacious building, with ever challenging upkeep, that the challenge is to keep it tenanted with blockbuster productions. The Palace is haunted, but think less Peeves more Grey Lady. Amongst the £5 worth of performer CVs and musical adverts you get if you buy a programme is a spine-tingling essay from David Gregory PhD detailing the 4 ghosts of the Palace. This is the story of one. Charles Morton (1819-1904) is a former manager of the theatre and the most sighted spectral celebrity. Visitors and actors have spoken of feeling his cool hands on their shoulders, a member of staff recounts losing her headphones as Charles swept past. One audience member reported having Charles, in full black suit, sit on their lap. If it was like Harry Potter then it would be like having a couple of long tubs of ice cream sitting across your thighs. According to Pottermore Hogwart’s is a happy home for ghosts, because the living treat their dead castle-mates with tolerance and affection, no matter how many times they have heard the same old reminiscences. Similarly, after theatres empty each night, many illuminate a single unadorned lightbulb above the stage, so the theatres' passionate spirits can continue treading the boards, keeping them content. JK Rowling told a journalist when she finished the saga she thought she had about another 3 Harry books in her but she would never write them. 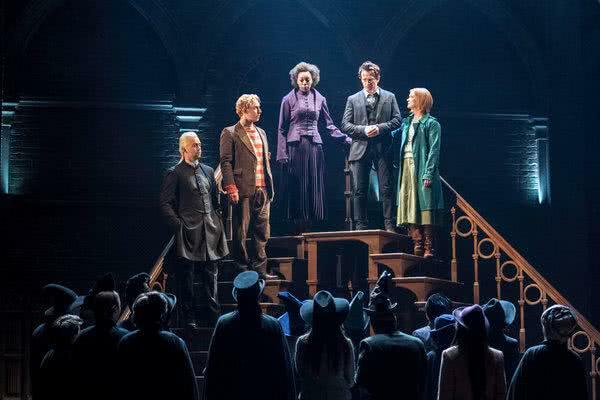 Rowling has been approached many times over these years to do a stage adaptation of the books, most often a musical version and she just wasn’t interested. Jack Thorne and Tiffany’s brought a bright new idea to Rowling. It would be a monument to Harry Potter, but it would also break new ground. They had glowing track records, she’d enjoyed working with Steve Gloves on the film adaptations and she was excited. What was written by Rowling & what is the collaborators? People on my Potter tours think it was mostly written by Rowling’s collaborators, with Rowling’s name placed upon it. Unpicking it, I think the emotionally complex relationship arcs are down to Rowling. The plot I suspect is what her co-writer Jack Thorne brought to the party. I suspect the capers were a collaboration, since Rowling would have needed to know what is possible with stage magic. The results are astonishing and fresh, since it doesn't try to recreate the scale of effects in the movies. It is a kind of Force Awakens homage, filled with delight, grounded in the world and characters we adore. But it doesn't feel like Rowling's craving for the new and original. And there was at least one clunky written for stage scene. And 'V day', er OK. Still I loved nearly every minute. I was struck temporarily deaf as I drunk in the prop of a fevered scene, a map of the route of the Hogwarts Express up to it’s home Hogsmeade; I tried desperately to burn it's meandering course into my memory. I needn’t have bothered. Jonn Elledge, my bro by a different Molly, already has drawn the map for us from memory. We are all one, Albus bless you sir. 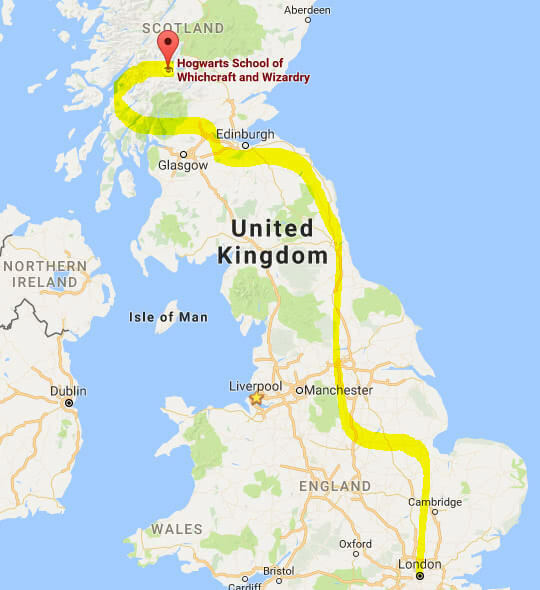 It would appear to put Hogwarts Castle perched in a glen North of the Trossachs national park, although the route zig zags all over the West Highlands. 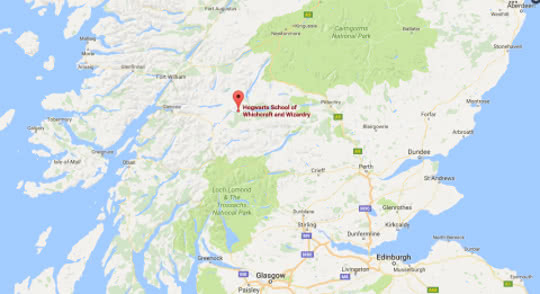 For a time committed Potter-heads managed to get a marker on Googlemaps for Hogwarts at Lochshiel, where the lake was filmed and the model of Hogwarts digitally inserted. Merlin's beard, they know where we are! I can imagine the tourists turning up scratching their heads, tramping around endlessly and then asking down the local pub 'where the f##! is it?' and they'd be like 'ah, well that would be the concealment charm you see'. It's now vanished, unplottable once more. Google was not impressed. JK Rowling has personally commanded me, via youtube, to keep the secrets. She’s also pilloried media outlets. Explore MinaLima an exhibition of Harry Potter design around the corner from the Cursed Child's theatre. Tour for Muggles review, visit most of the Harry Potter sights in central London. Visit where the Cursed Child begins, platform 9 and 3/4 on the Warner Brothers Harry Potter studio tour. I run Potter Tours charting the inspirations of the books in Edinburgh, here’s my scatter brained fan-boy review - I hope it spoils little, but if you’re definitely going, just skip it. Personally I’d love it if JK sent in the Obliviators, then I could have my first time all over again. There is a very clear Dumbledore moment, sans Dumbledore, in fact someone much more unlikely. JK Rowling’s younger children right now are teenagers and it’s wisdom for parents of adolescents. As usual it is plot happy and my friend declared Warner Brothers have 5 movies on their hands. Well at least in their damp dreams. It is stuffed full of scenes you’ve always wanted and burned for. Think of an injustice you grieved for in the books - the play addresses it. One of the topics the play explores shame, both Harry and pivotally a boy's. Who is turned dark by it. In Harry Potter shame and humiliation is no great and powerful force for good. The world is ruined by it. In an age of Twitter shame vigilantism, it’s seems timely. It answers ‘What was up with Dumbledore?’, a thing a thousand memes have poked fun at. He was haunted and damaged and this is explored more thoroughly than in the books. As is his regret. The scene is filled with 1-Troll-ton of memes put into dialog, the play sparkles, it’s like they’re cannonising nitpicking. The many many set changes and the props are cleared from the stage with a flourish of wizardry cloaks, it oozes attention to detail. It's like they've asked 'what's expected from a play?' and done everything possible to bust that. Snape might or might not appear. If he does he’s drier than a desert and should be made a world heritage sight. But he probably won’t. Everything is wonderfully woven into the world, there are multiple points where I was hugging myself in glee. We follow the bad crowd, they are the play's heroes, Harry was raggy-doll-lite, the Cursed Child's heroes have a lust for ‘mayhem’, also known as significance, striving to make a mark through their conception of good. But it’s mostly mayhem to be honest. There’s a touch of Ron about the lead character, the Cursed Child, living under the shadow of the great accomplishments of others. Ron is a joy, he has many scenes of laughter, although it's almost always laughing at him, rather than some wisecrack he's made. In the shadow of the great & good he becomes more the jester, than the checkpoint voice of sanity. On my Potter tours Potter heads have complained about Harry in the Cursed Child. They don’t like him. In the play Harry has risen to great responsibility but in so doing, has lost his heart. This is very true of many folk I’ve dealt with higher up in the government, full of honouring their mission they’ve become blinkered soulless human beings, uncaring for their fellows. It’s not a happy situation, but Harry’s character felt authentic to me. Rowling's theme being redemption and growth. It started surprisingly, with a giant montage. Theatre is often kitchen sink dramas stuck in one location for long long arguments. But this jumped all over the place sketching in characters and predicaments, zooming through time. The stakes weren’t trivial, the story may be hung around Rowling’s complicated relationships, but it’s no kitchen sink play, it’s made very clear it’s life and death for the liberal wizarding world and our dear friends. Tons of it, a whole world is created around ‘what if this had happened?’, scenes. My friend hadn’t read the books and didn’t find the self-sacrificing credible, but character’s motivations are clear. There’s a very poignant moment at the end which had my row snivelling, the play reaches back to the very beginning as the story comes to an end. It’s unlike Fantastic Beasts it’s still a ‘kids story’. Ultimately the great and powerful adults are rendered helpless and it’s greatly down to the younger generation to determine the fate of the world. It’s an electric scene watching societies faith in the wisdom of their great and good leadership shattered. I laughed repeatedly, I teared up, I loved it more so than any other large production, and I consider myself now spoilt on theatre. JK Rowling has said she’s written Harry’s story now, everything there was. She’s not excited by an episode where Harry’s a grandparent. So this is it. The last visit with the boy who lived. MinaLima a 4-floored exhibition of Harry Potter design around the corner from the Palace theatre. Tour for Muggles, visit the Harry Potter sights in London on this 2½ hour walking tour. How to get the most out of the fabulous Warner Brother's Harry Potter studio tour. 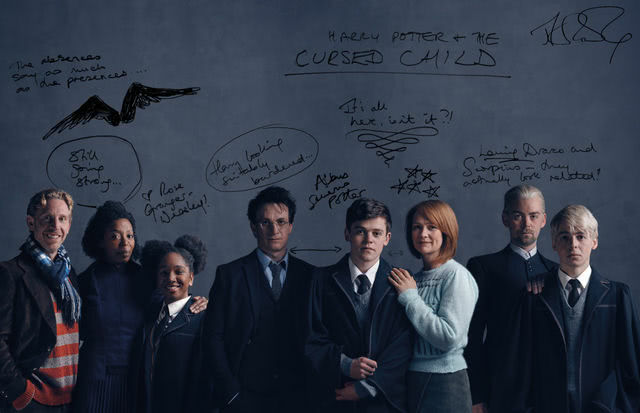 JK Rowling's notes on the Cursed Child cast explained on Pottermore. New York Times has the photo of Hermoine & Harry & Ron atop the stairs. 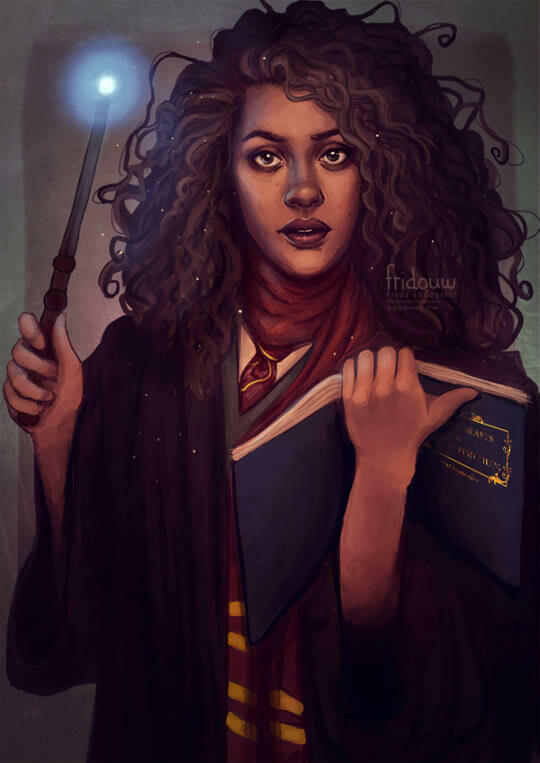 fridouw created the fabulous Cursed Child Hogwart's Hermione. Was this blog interesting or useful to you? Could it be bettered? Please react, it encourages me to improve.